“It has literally taken twice as long to go from congressional approval to construction of a World War II Memorial than it did to fight and win World War II in the first place,” said Rep. Bob Stump, Arizona Republican and sponsor of the bill. 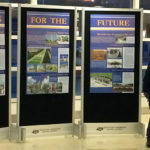 If approved by the Senate and signed into law, the bill would stop any future review of the project by the National Capital Planning Commission (NCPC) or any other agency and end a lawsuit filed against the National Park Service last year by Save the Mall, a civic group opposed to the proposed memorial’s site and design. The House passed the bill on a 400-15 vote. The Senate could take up Mr. Hutchinson?s bill within two weeks. Mr. Hutchinson said he would not mind if the Senate considers the House bill, which is slightly different from his. It was not clear if President Bush would sign the bill. His father, former President George Bush, is a World War II veteran and an honorary chairman of the memorial’s foundation. One leader in the effort to build the memorial — World War II veteran and former Senate Majority Leader Bob Dole — said it’s “absurd” that the process has taken since 1993, when legislation for the memorial and the site were approved by Congress. Mr. Stump said “millions of World War II veterans have gone to their eternal rest” since then. “I am just happy that finally Congress is coming to our rescue,” Mr. Dole said. Former President Bill Clinton dedicated the memorial site on Veterans Day 1995, and a groundbreaking ceremony was held at the site in November. A dedication ceremony for the memorial is scheduled for 2004. More than $170 million in private funds has been raised for the memorial — $10 million more than the estimated $160 million price tag for the project, including costs for construction and for its maintenance by the Park Service. The federal government has chipped in about $16 million, memorial spokesman Mike Conley said. He said excess funds will go to the memorial’s upkeep and education programs. Several federal agencies, including the Commission on Fine Arts and the NCPC, already have approved the site and a design by architect Friedrich St. Florian. The NCPC voted this month to hold two days of public hearings on the memorial next month to review the commissioners’ decision-making process. NCPC Executive Director Patricia E. Gallagher said yesterday that the bill “takes [the commission] out of any future review of any design of the memorial.” The legislation says construction must be based on the design approved last year by the fine arts commission and the NCPC. 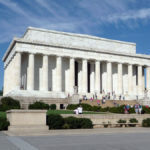 The memorial is to be built around the Rainbow Pool east of the Lincoln Memorial and west of the Washington Monument. Its design includes a sunken plaza ringed by 56 granite pillars and two 41-foot arches. “There are some other factors of the design that have not yet come to us,” Ms. Gallagher said, adding that details about the lighting, color and type of stone, sculpting and inscriptions on the memorial had not been worked out. The commission would have no say in those matters if the bill becomes law, she said. “It’s not a welcome precedent to have our jobs taken away from us,” Ms. Gallagher said, adding that the June 13 and 14 hearings will be canceled if the bill is signed. Mr. Dole and others said any more delays in building the memorial mean fewer World War II veterans will see the tribute to them. “We have gone from the greatest generation to the disappearing generation,” he said, adding that 1,100 World War II veterans die each day. During floor debate, House members stood in support of the memorial, and many noted that of the 16 million Americans who served in the armed forces during World War II, only 4 million will be around to see the memorial when it is completed. Nearly two dozen House members spoke in favor of the bill. Only D.C. Delegate Eleanor Holmes Norton, a Democrat and the District’s nonvoting representative, rose in opposition. Mrs. Norton said the bill was “radically destructive” and would “eliminate indispensable oversight.” “To members . . . of [that] generation, we all say thank you for your service and sacrifice. It is time to build a memorial to honor your actions,” said Rep. Lane Evans, Illinois Democrat.